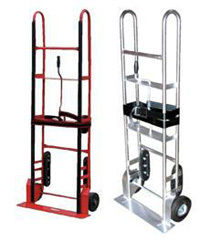 for moving items up and down stairways. See table for specs (*includes (2) 3 1/2" x 1 1/2" Mold-on-Rubber rear casters). 24" x 12" x 59 1/2"
24 1/2" x 13" x 60"